When the kids have grown into young adults and have moved into their own homes, empty nesters are faced with decisions about what to do with their empty nest. Some choose to downsize, while others want to stay in the home where they raised their families. If you are choosing to stay put, you will have one or two or more extra bedrooms that can be reconsidered and transformed into spaces that can be useful, indulgent or practical. Before you get started creating the room of your dreams, have your grown kids come and take any mementos or souvenirs from their former bedrooms. 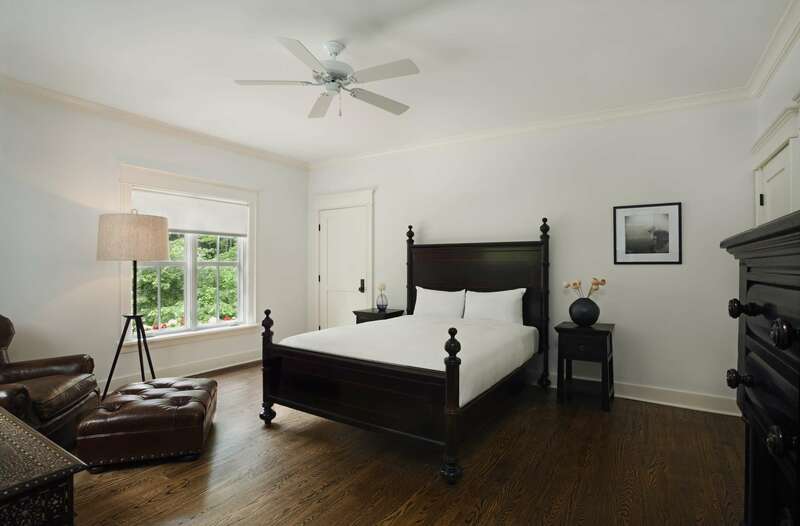 An obvious and useful choice for an empty bedroom is creating a guest bedroom. Unlike a child's room, which is decorated precisely for the inhabitant, including photos, posters, sports memorabilia and trophies, a guest bedroom should be a calming, welcoming space that anyone will feel at home in, including grown children when they come to visit. If the bedroom has an attached bathroom, even better - but if not, that's ok too. If there are multiple empty rooms, choose the one farthest from the master bedroom for guests to stay in to maintain privacy. Having a home office is not even a luxury anymore - for many people, it's become a necessity as more and more of us telecommute and work as independent contractors. Especially for empty nesters who may be transitioning from full-time to part-time jobs, a home office offers the stability of a place to work that isn't the kitchen table. It's easier to be productive and motivated when there's a place to call your own, shut the door and focus. Creativity can flourish when caring for and raising children is done. Turning your attention to what brings you enjoyment and satisfaction can take a part-time hobby into a full-time business with sites like Etsy, where crafters and DIY-ers sell their creations and find inspiration for projects. Getting organized in a crafts room can be a daunting task, but with the right information, it can be done quickly and easily. A home gym can get even the laziest among us up and moving. It's hard to think of an excuse to not work out when your treadmill is just down the hall. Creating a home gym can be as simple as buying a treadmill and hanging up a mirror and a TV, or it can be a miniature version of a professional gym, with floors for comfort, weight training machines, and more. Just getting moving will be beneficial, whatever type of gym you want. If sweating and huffing and puffing aren't your thing, maybe a meditation room is what you would enjoy. Designing a calming and soothing space to meditate, think, nap or just read a book is a luxury that will help anyone live a calmer and better life. Look for big, comfy floor pillows, a daybed, soothing colors and dimmer switches on all the lights. Add a cozy blanket and a portable speaker to listen to the music that helps you to feel relaxed or to meditate effectively, and you have the perfect place to go to decompress. The nice thing about a home library, for those who are book lovers, is it doesn't have to take up a whole room. If you have a guest room, adding shelves to one or two walls and filling them with books is a nice way to store your favorite tomes and offer guests lots of reading material to peruse when they visit. In addition to books, a few personal items like family photos, vacation mementos, and other keepsakes can personalize your bookshelves, adding warmth and a welcoming feeling for visitors. If your empty nest is now grandma and grandpa's house, having a nursery/children's room is a wonderful way to welcome your kids and their families home for visits. There's nothing better for parents than feeling like their children have a place to play without disrupting the entire household. You don't need a full-on baby's or children's room to make a place for the grandkids - a portable crib, a trundle bed and a few baskets for toys are enough to make a space comfortable. The concept of a man cave has become a cliche', but the reality of one is still something many men would enjoy and use a lot. Whether the man of the house is into listening to loud rock and roll or watching endless sporting events on a large screen TV, having a place to call his own can be a good thing for him and for his wife or partner. The empty nest offers plenty of opportunities for time together - a little time apart can't hurt. A man cave can also be used as a dressing area, with closets and storage for just his clothes, shoes and other apparel. There's no reason the men should have all the fun. If you have some extra money and the room to do it, why not create the ultimate spa-like bathroom? Use one of the empty bedrooms to create a "lady lair," complete with a jacuzzi bathtub, steam shower, vanity with lots of mirrors, storage and space, heated floors and towel racks, a TV and whatever else would add to your sense of total and complete relaxation. If you've lived with tiny closets for too long, a walk-in closet is an excellent use of a spare bedroom. Whether it's shared or for just one person, the luxury of having the space to spread out when you're getting dressed, the ability to see everything you own instead of burying things in drawers, never to be seen again, and even having sanctuary to retreat to can be a wonderful way to use the empty space in your home. Adding a washer and dryer to the closet makes it even more functional. Be sure to get good lighting and add a small table and chair for ease with putting on jewelry, shoes and more.